This post is part of YummyMummyClub.ca's Blogger Review Team Sponsorship Program. I received free samples from Proctor and Gamble in order to write this review. This post reflects my personal opinion and was not influenced by the sponsors. 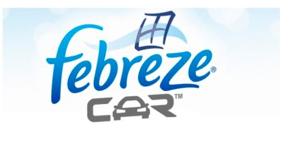 To see other Febreze CAR Vent Clips reviews and enter to win a $130 Get Fresh Prize Pack (which includes a $100 Gift Card), click here. Did you know that according to Statistics Canada the average Canadian spends more than 110 hours per year commuting to and from their jobs and 82% of Canadian commuters drive a car to and from work? That is a LOT of time in a vehicle! Even for those of us who don't have to commute when you add up all the time spent taking the kids to and from various places it can start to feel like we live in our vehicles. We live in a part of Canada where it is cold. Really cold. There is snow for many months of the year and every time you get in the vehicle you tromp in large amounts of snow. 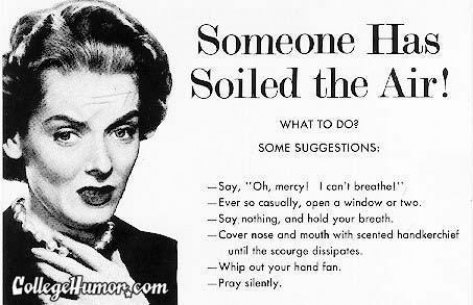 Of course as soon as you turn on the heater that snow melts into disgusting dirty piles of muck on the floor beneath your feet. Those dirty disgusting piles of muck SMELL like dirty disgusting piles of muck. And if you happen to stop for the occasional meal on the go, and if your kids drop the occasional French fry in the muck, and you don't notice right away the French fries disintegrate into the muck and then freeze overnight and then thaw into an even grosser smellier version of the muck the next day, and then you are already late for school so you can't stop to clean congealed French fry muck so it freezes again and just gets worse... well you get the point. It's disgusting. Eventually the general aroma of the vehicle is an all-around less than pleasing ode to winter-funk. There is pretty much nothing good about that. Not to sound too much like an info-mercial but finally Canadians can breathe happy in their cars! 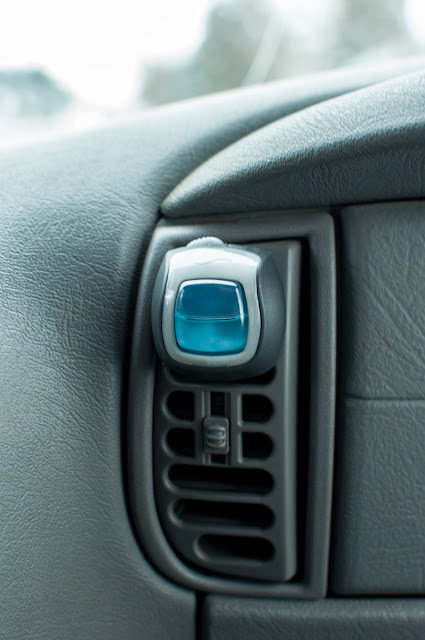 Febreze CAR Vent Clips are super convenient little clips that attach neatly to any air vent and use a combination of the vehicle's air circulation and "Febreze technology" to eliminate odours for up to 30 days (on low and under ambient conditions). The CAR Vent Clips are super easy to use. I mean REALLY easy to use. My kids could probably have installed it no problem. I was worried that it would leak everywhere but as it turns out, it wasn't a problem at all. Each package has a scratch & sniff sticker on it so you can be sure you like the smell before you buy. 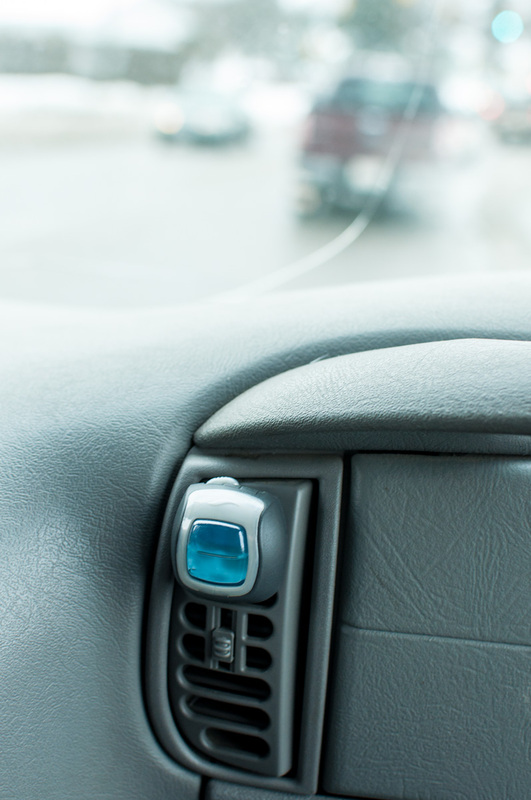 The CAR Vent Clips come in 4 different scents: Linen & Sky, Meadows & Rain, Hawaiian Aloha, Thai Dragon Fruit and NEW Midnight Storm. I am particularly fond of the "Linen & Sky" scent but my family seems to enjoy the Midnight Storm scent best. I was worried that the scent would be totally overpowering but there is a handy dandy "scent intensity dial" that makes it easy to control how strong the scent is. I will say that even on the lowest setting when the heat is on full blast the scent did get a little strong for me... but I was sitting right in front of it! No one else seemed bothered by it at all. I especially like how the CAR Vent Clip looks- I think it looks pretty! It is discreet and classy-looking and actually looks a lot nicer than our plain old boring vents on their own. 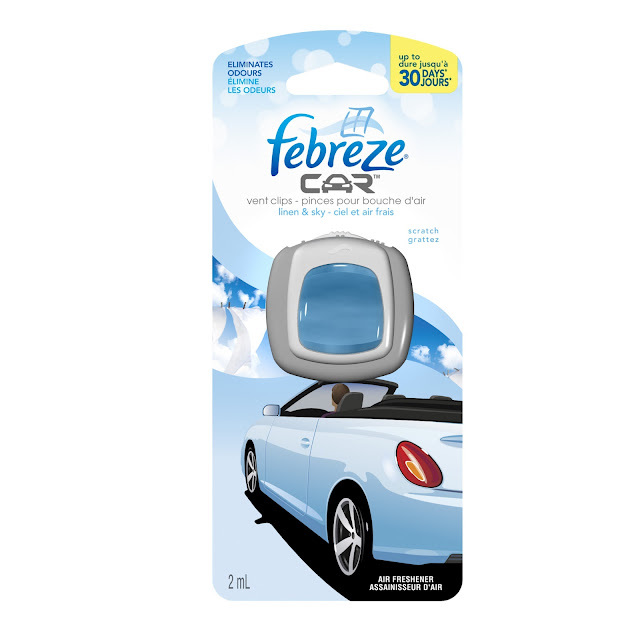 Of course the best part of the Febreze Car Vent Clips is that it got rid of that nasty winter funky smell that has been hanging around in our vehicle for the last few months! I'll take Midnight Storm over eau de mouldy-french-fry-in-dirty-melted-snow any day! To see other Febreze CAR Vent Clips reviews, click here. I don't have a car but if I did I would so use these!